The Metrodata LH1000 enables the transmission of LAN frames across satellite links via serial modems. The LH1000 product has now been superceded by the much more flexible and fully manageable MetroCONNECT LHM1000 product which offers advanced functionality. The LH1000 is no longer available. The LAN interface is auto-sensing and supports 10M, 100M, full or half duplex working. Manual selection of 100BaseT FD operation enables connection to fixed config router ports. It is presented as an RJ45 connector and offers automatic MDI/MDI-X interface selection to obviate the need for cross-over cables. The LAN interface utilises an efficient HDLC encapsulation with address learning and filtering at up to 148810 packets per second. Rate decoupling is supported by means of a 1000 packet SDRAM buffer store, and no packets are lost providing that the sustained data rate is below the DTE serial port speed. 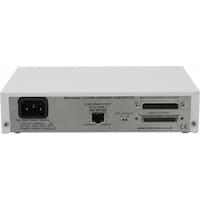 The low speed multi-standard port offers the options of RS-232, EIA-530, X.21, V.35, RS449/V.36 interfaces, depending upon the type of interface cable fitted to the port. See the Order Info tab for details of the cables that Metrodata supply for use with the LH1000. HSSI Interfaces on Satellite Modems can go as high as 90Mbps, but typically HSSI is only used up to 51.84Mbps or STS-1. This is the "theoretical" maximum speed of HSSI (also known as EIA/TIA612). This limitation is due to router HSSI Modules unable to go any faster than 52Mbps. The other problem with running HSSI at high speeds is that the line driving capability is drastically reduced with higher data rates. With the LH1000 it is possible to support an Asymmetric Satellite service with HSSI used for the higher rate and EIA530 used for the lower rate. This can be a more cost effective solution than buying 2 x HSSI Satellite Modems. The LH1000 supports a maximum packet size (MTU) of 1536 bytes which is sufficient to transport double VLAN tagged frames (Q-in-Q). The LH1000 can easily be rack mounted in either a 1U two unit rack mount kit, a 6U eighteen unit rack mount kit. This application shows an LH1000 offering Ethernet services over EIA530 and HSSI satellite modem equipment. The LH1000 supports high speed satellite modems with HSSI interfaces at data rates up to 110Mbps, or lower speed satellite modems with serial interfaces such as EIA530 at data rates up to 20Mbps. The LH1000 will even work with separate satellite modulators and demodulators even if these have different interface types (e.g. a HSSI satellite modulator and an EIA530 satellite demodulator). This application shows how an asymmetrical Ethernet service can be delivered over satellite, using LH1000s and Cisco Catalyst switches. In this example a single HSSI satellite modulator is used to multi-cast the transmit data with multiple lower speed satellite links using EIA530 satellite demodulators being used for the return paths. The LH1000 product has now been superceded by the much more flexible and fully manageable MetroCONNECT LHM1000 and MetroCONNECT WCM-Serial products which offer advanced functionality. Strictly limited stocks of LH1000 are available for existing users.